Just in time for winter: The Outdoor Power Equipment Institute has tips on safe handling and operation of snow blowers. With winter arriving a little early thanks an icy blast from the Arctic, it’s even more important for government facility managers to keep snow blower safety in mind. The Alexandria, Va.-based Outdoor Power Equipment Institute (OPEI) is offering tips to educate snow blower users about safe handling and operation. Here are several of the OPEI’s snow blower safety pointers. Make sure your snow blower is in good working order, before the first flakes fall. Change the oil. Install a new spark plug and inspect the belts to be sure they are in good working order. If you forgot to drain the fuel last winter before storing your snow blower, drain the tank now. Check the auger (always in the “off” position) and adjust any cables. Make sure it starts. Before it snows, clear the pathways you intend to use. Snow can sometimes hide objects that might clog the chute of a snow blower, or cause damage to the machine or people nearby. Remove doormats, sleds, boards, wires, and other debris from the pathways you intend to clear. Use the right fuel. It’s important to have the proper fuel on hand, as filling stations may be closed if there is a power outage after a snowstorm. Store fuel properly and buy the type of fuel recommended by your equipment’s manufacturer. It is illegal to use any fuel with more than 10 percent ethanol content in outdoor power equipment. Editor’s note: For more information on fueling properly go to this site. Handle fuel carefully. Use non-spill containers with spouts. Fill up the fuel tank outside before you start the engine and while the engine is cold. Never add fuel to a running or hot engine. Store fuel in a clean, dry, ventilated area, and never near a pilot light, stove, or heat source. Never smoke around fuel. KEY SAFETY TIP: Never put your hands inside the auger or chute. Use a clean-out tool (or stick) to unclog wet snow or debris from your snow blower. Your hands should never go inside the auger or chute. Go here for an online version of an OPEI snow blower safety fact sheet. 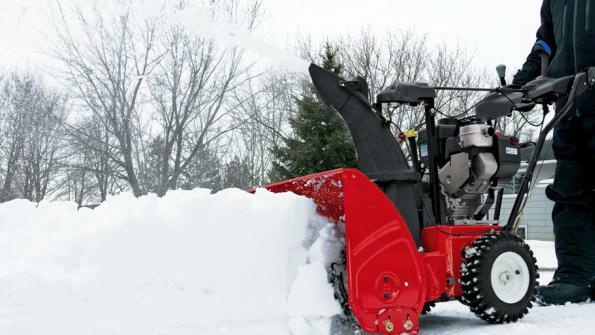 This Toro training video offers instructions on how to use a snow blower safely.